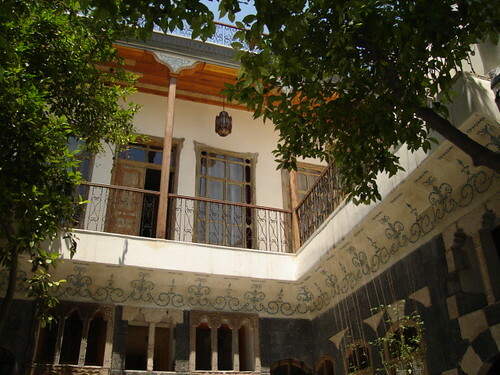 On a recent tour of old Damascus, I happened to visit the “Beit Al Mamlouka” hotel, located in the heart of Old Damascus, Bab Touma. 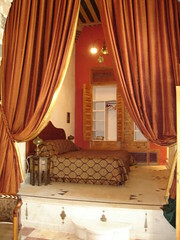 The hotel dates back to the 17th century and combines a mixture of Mamlouk and Ottoman influence. 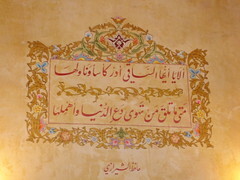 “Al Mamlouka” in Arabic means “the possessed”. 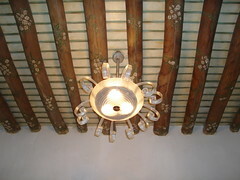 The hotel was previously a home to a Syrian family and was in a very bad shape. It’s current owner undertook the daunting task of restoring it to it’s previous glory, maintaining all of the house’s original design, and turned it to a 9 bedroom hotel. 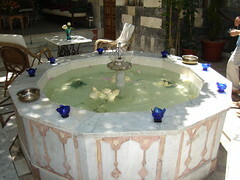 There are 5 hotels such as this in Aleppo, but this is the only one of its kind in Damascus. 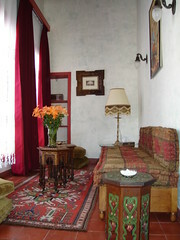 Each hotel room has a unique design as well as it’s own special name such as the “Suleiman the Magnificant” suite, the “ Antar&Abla” room, and the “Abu Firas Al Hamadani” restaurant and bar. 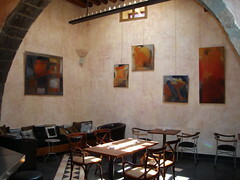 What I liked most about this hotel were the little touches displayed here and there and the attention to detail, such as the verses of poems written on the wall above the bar, the well in the courtyard, and the beautifully decorated ceilings. 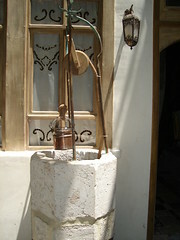 -Apparently, people in old times used to turn on the Bahra(fountain) when they were discussing something private or of importance to drown out their voices so that no one could hear what they were actually saying. -People in old times used to heat using charcoal stoves, and this emitted high levels of carbon dioxide, that’s why most rooms in Arabic houses had one wall built and layered in a special way with wood and other materials then covered with whitewash to absorb these toxic fumes. ae haa, we just need this kind of work to restore our beautiful city and promote it internationally. I tried to enlarge the photos but it took me to flicker. do i have to register to save the photos?? I am tempted not to sleep at my home next visit. Amr: I've changed the photos settings so now you can get a larger view without having to register with Flickr. Nurhan: I agree with you! 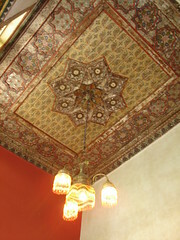 Sinan: I also felt like spending a few nights there. Very beautiful Hotel, I wasn't aware of it. I must visit it soon. I think renovating these old houses and transforming them into hotels or restaurants is the best think that has ever happened to our gorgeous old cities. (It is an Aleppine innovation BTW). They are mushrooming here in Aleppo, and they are one of the reasons behind awarding Aleppo this prestigious award. Great, very beautuful, dina, did u take those pic urself??? Baher: You should really go see it, it's great. Rami: I totally agree with you. I have read your post on the award and I think that's great. I will be looking forward to reading your post. Ghalia: Yes I did take them myself. AMAZING..every time you visit Syria you find out new and wonderful things, such a rich history. 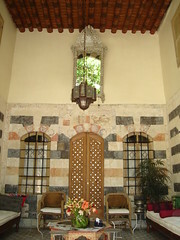 Do you know the Baron Hotel in Aleppo..
Looks great! Thanks for the info Dina. Is it this house near Hammam Al-Bakri that is painted pink from the outside? Omar: Thanks.Glad you liked it ;) I also liked the bit about carbon dioxide. 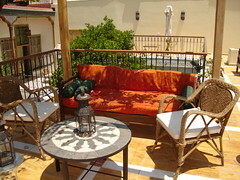 It makes me want to stay over a day or so in it eventhough I have my home in Damascus, still it would be a nice vaccation! What a beautiful place. I too would really like to stay there one day.. Having lived abroad for almost 3 years now, i have come to appreciate more our art and wealth of culture. Great post Dina and lovely pictures. Catherine: Thank you for dropping by:) I also felt like doing that. Great pictures. Looks like a fantastic place I hope your stay there was fun. Shop Girl: Thank you :) You're very kind. THe post is beautiful, it makes u wanna visit! I am Egyptian, never visited Syria, but had Syrian friends though. I would love to come visit some time. I also liked the bit of info you added at the end of th post..